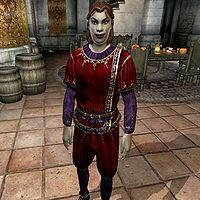 Ulen Athram is a Dunmer commoner that lives in the Imperial City's Talos Plaza District with his wife, Dralora Athram. A retired flin trader from Morrowind, Ulen apparently lives the life of leisure in the Imperial City, even though he carries a dark secret; he is a Mythic Dawn sleeper agent and will attack you on sight upon completion of the Path of Dawn quest. After his breakfast on Morndas, Middas and Fridas, he will spend four hours strolling around the house until 12pm, when he will take a short one-hour walk around the District before visiting Soris. Afterwards, at 6pm, he will take yet another stroll in the District before going home to his wife at 8pm. On Tirdas and Turdas, after finishing breakfast at 8am, he travels to the Market District and spends the morning there, until it's time to pay Soris another visit at 1pm. At 6pm, he will enter the Tiber Septim Hotel and take a two-hour dinner until it is time to return to his house. On Loredas and Sundas, he will, at 8am, travel to the Arboretum and spend the next twelve hours strolling around amidst all the statues. At 8pm, he heads for the Arena to bet on his favorites; the Yellow Team. When the Arena closes up at 9pm, Ulen heads back to his house and wife for one hour of quality time before his usual bedtime at 10pm.